It feels fitting that in the run-up to Earth Day, a day meant to have us reflect on how we treat the earth and its delicate resources, the first criminal charges were filed in the ongoing Flint water crisis. One of the worst environmental racism cases in recent memory, three low and mid-level bureaucrats and scientists were charged with data manipulation and misleading the government that contributed to the poisoning of thousands of men, women and children. It’s a ray of hope for accountability in the never ending nightmare for the people of Flint. But it’s also far from a closed case: people in Flint are still getting rashes and their homes are worth nothing. Michigan’s Governor Rick Snyder took the news earlier this week to theatrically pose with the water and pledge to drink it for the month, despite many contaminants beyond lead continuing to leach into the water. Governor Snyder has repeatedly resisted calls to resign, while doing little to change the situation on the ground for Flint’s residents. We should all be furious. Not just by how this crisis has been handled, but by the fact that it had been allowed to occur in the first place and for so long. 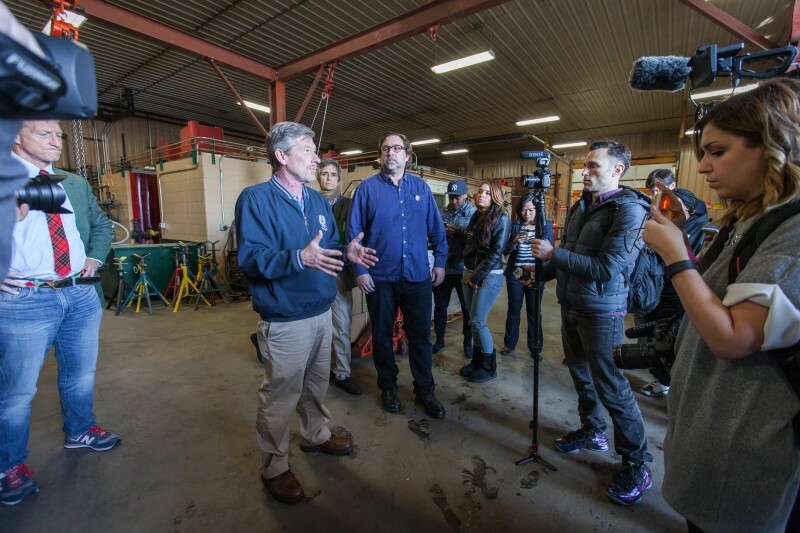 Last month, Green For All travelled to Flint to witness first-hand the water crisis with local residents, who are still living entirely on bottled water. We first met Desiree Dual, who recounted the process of watching her children getting progressively sick for months, and then one day stepped out of the shower to find blood coming out of her ears. Now, she’s organizing water deliveries for local residents and fighting for the resources for her pipes to be fixed — all while taking care of her sick children and her own health. Then we met Harold Harrington, business manager of the local plumbers and pipefitters union, United Association Local 370. Their union is working to replace pipes, all the while living with poisoned water and pipes themselves. Harold told us his home, which his family spent years paying for, is now worth nothing because of Gov. Snyder’s actions. Existing laws make it illegal to sell a home with known water quality issues. Flint residents are trapped in their homes, with poisonous water continuing to stream from their taps. And their homes are now worth nothing. As Congressman Matt Cartwright so powerfully stated during Congressional hearings last month, this is a man-made disaster created by Snyder himself, who thought saving a buck was more important than the health and wealth of an entire city. And amidst all of this, the cost of handling the crisis is ultimately falling on the families of Flint — with their failing businesses, dropping home values, and rising medical bills. Gov. Snyder’s experiment with putting toxic water through Flint’s pipes has corroded ever pipe in Flint, poisoned the water of 100,000 people, and wiped out the wealth of an entire city. This leaves only one path forward to getting Flint’s residents access to water again: Gov. Snyder must flix Flint’s pipes immediately, and he needs do it with local labor. The state and federal governments haven’t yet stepped in to fix it, other than the band-aid of bottled-water pickup stations available to mobile residents. That’s not a solution. Residents have set up their own systems for distributing clean bottled water and caring for disabled, elderly, and homebound residents — but this isn’t sustainable. either Many of those providing help, like Desiree Dual, are struggling with their own health issues from the water. Every corroded pipe in Flint is Snyder’s responsibility; every child struggling at school in Flint because of lead poisoning deserves Snyder’s financial support to do better; and every family who has watched and been affected by this economic devastation deserves the investment in Flint’s infrastructure that is essential to recovery. We deserve investments in our communities after years of deliberate actions to poison our air, water, and land. As we move to fix this problem by keeping fossil fuels in the ground and investing in clean and renewable energy, the first investments in new infrastructure have to go to the communities who have been on the receiving end of our country’s worst political and corporate greed.